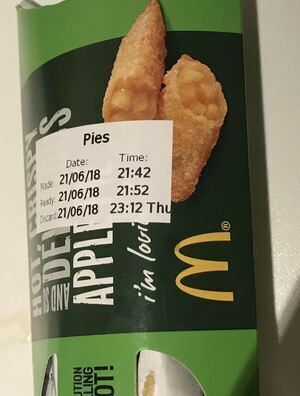 Posted in Misc and tagged McDonalds, shelf life at 9:01 am on June 22, 2018 by Chompsky. I believe they’re only made to order so I’m not sure it’s an example of food waste. Except for the fact that the apple was wasted going into that when it could have been in a lovely tarte aux pommes or something. I doubt if they are made to order. There is a ten minute gap between them coming out of the fat and being cool enough to sell. If you add another, say, 3-4 minutes for the actual cooking it would be a long wait. They also have a 80 minute shelf life. Irony – on the longest day of the year. You are looking at a mess with about a two hour life span. My Dad used to love them. He’d get one every time we went to McDonald’s as kids. Guess who didn’t get one? Everyone else. An injustice that rankles to this day. Best Mickey D’s offering in my opinion. Why are are they always so damn hot though? Nom. Why are they hot? Because they are deep-fried in oil. The 10 minutes between the ‘made time’ and the ‘ready time’ is to allow them cool down. Isn’t it not because they nuke them? yeah, no, it isn’t not. You should go into politics. Probably takes 80mins for them fiery things to cool down. 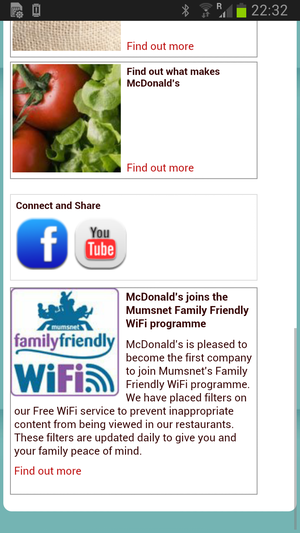 After which, MacDonalds probably don’t wish their customers to take them home and microwave, get hot apple burns etc. And you’re linking this toa Maccy Ds coffee thing because?